The Dubai-based bank Mashreq has appointed Arabian Construction Company (ACC) to build its new headquarters building in Downtown Dubai. 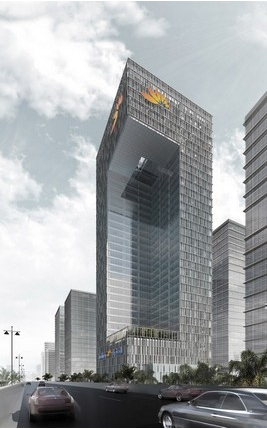 Mashreq will relocate from its current base near the Al Ghurair Centre in Deira to the new site at the junction of Financial Centre Road and Mohammed Bin Rashid Boulevard once construction of the tower completes. ACC is due to begin building work in December under a 28-month contract, with the tower due for completion in April 2019. Mashreq announced plans for its move in January this year. The bank, which was established in 1967, has appointed Chicago-based Skidmore Owings & Merrill — the practice which designed Burj Khalifa — as architect. It has designed an L-shaped building that will be 151 metres tall, containing four basement levels, one ground and 35 upper floors that will have a built-up area of 71,292 square metres. Securing the contract to build Mashreq’s new headquarters is the latest of several major new contract wins for ACC. Within the past two months, the company has won contracts to build the 63-storey Boulevard Point tower in Downtown Dubai for Emaar Properties and a deal to build two apartment towers for Emaar’s Saudi Arabian subsidiary, Emaar Middle East, at the Jeddah Gate development. It has also picked up a $200m (Dh735m) contract to redevelop a children’s cancer hospital in Egypt.